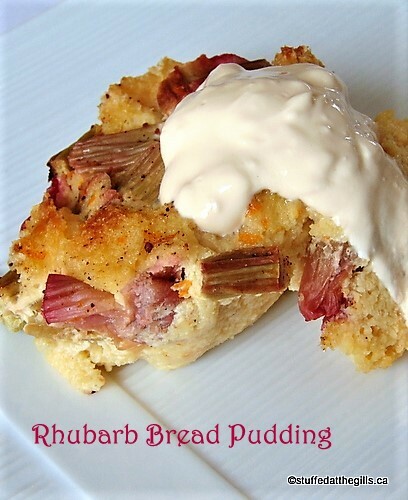 Rhubarb Bread Pudding makes a warm and comforting dessert on cold winter days. 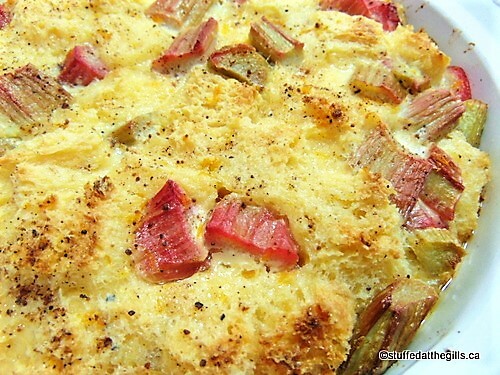 Use some of that frozen rhubarb from the garden and be reminded winter will not last forever. It's been cold the last few weeks (it is winter, eh...) and I've been feeling the need of warm foods even for desserts. 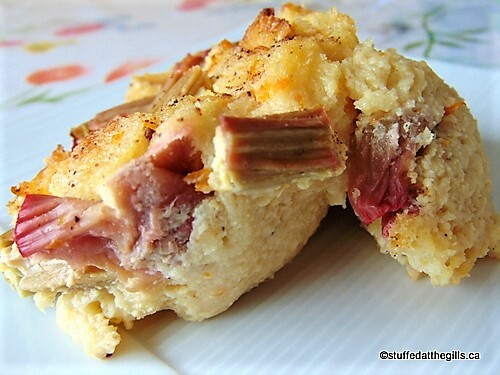 Bread Pudding fits the bill nicely and I've had this recipe for Rhubarb Bread Pudding for years. It's in the Sidney River United Church Women's Association cookbook that my Uncle gave Mom years and years ago. (1960s) I tried the pudding and just didn't like the texture. 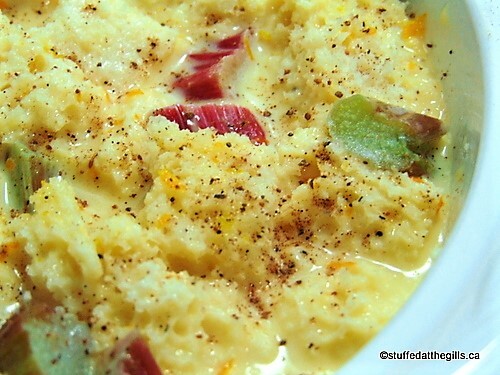 Not enough eggs and the bread crumbs just didn't do anything for the pudding. But it tasted good. The sweet pudding complemented the tart rhubarb perfectly. I decided to fuse my regular Bread Pudding recipe with the one in the cookbook and it turned out just lovely and didn't take long to leave the pudding dish. When I went to make the pudding I didn't have any lemons in the house so I used an orange. Did I tell you it's cold outside? I didn't want to bundle up in all those layers of winter clothing and make the trip down the street to the store. By the time the car would have heated up I'd have been home. Therefore, the orange variation which is very good. I almost left out the lemon but thought that on a warmer day I just might make that trip to the store for a lemon. For best results use a sturdy homemade-style white bread. Make sure the bread is at least 2 or 3 days old so it will soak up all that lovely orange or lemon flavoured custard mixture. This time of the year it would be next to impossible to find fresh rhubarb in the stores so I used some I had frozen from the garden last summer. I noticed on my last shopping trip that frozen rhubarb was readily available in my grocery store as well. Make sure you thaw the rhubarb and squeeze out some of the excess liquid. Bread Pudding is often served with a caramel sauce but since this pudding is quite sweet I think cream or ice cream would make a better topping. Butter a 1½ litre (6 cups) baking dish. 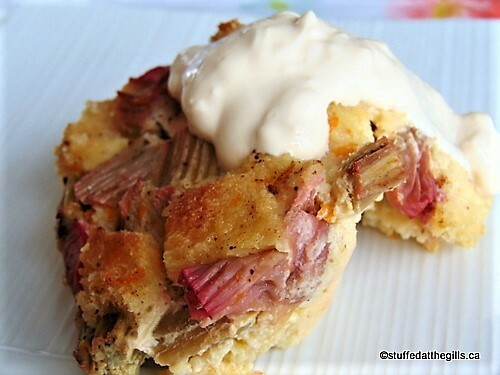 Place the bread cubes and rhubarb in the dish and toss together. 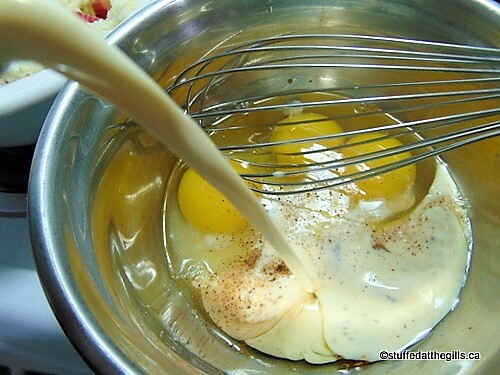 While the mixture is sitting, soaking up the custard, preheat your oven to 350 degrees. Place a larger pan in oven and half fill with hot water. You will use this to set your baking dish in so the pudding will not burn or curdle. This is called a water bath or bain marie. 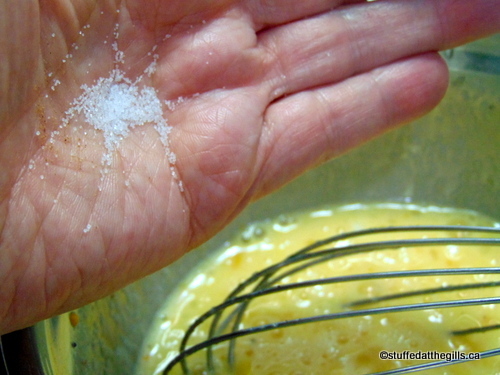 Sprinkle a little nutmeg over the top if desired. 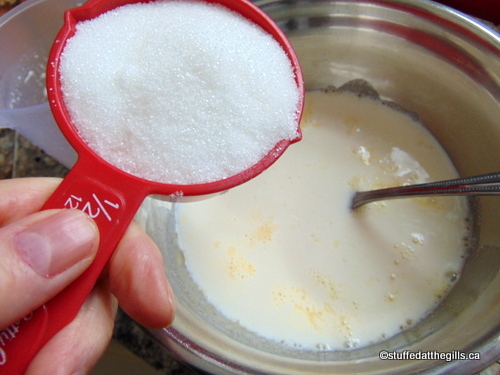 Place the pudding in the water bath and bake for 50-60 minutes or until middle is no longer wet and oozing liquid. Butter a 1½ litre (6 cups) baking dish. 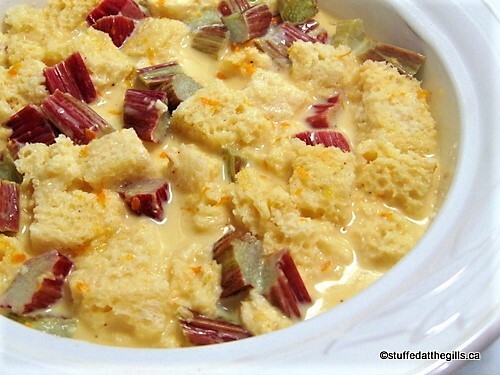 Place the bread cubes and rhubarb in the dish and toss together. I forgot to take a picture of the rhubarb. 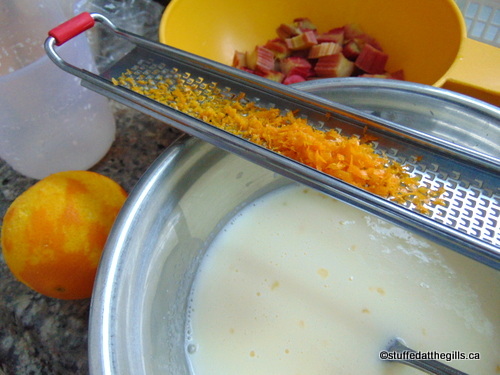 Mix in the orange or lemon peel, juice and vanilla. Don't forget that pinch of salt. You only need a tiny bit to enhance the flavours in the pudding. 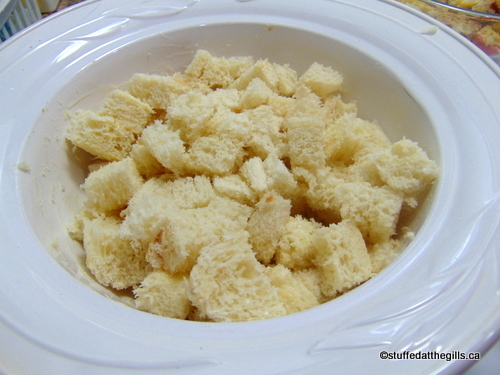 Pour the custard mixture over the bread cubes and rhubarb and let sit until well soaked. Thirty minutes is best but if you're in a pinch 10 minutes may be sufficient if you make sure there are no dry bits of bread sticking out of the pudding. Before baking you may wish to sprinkle the top with a little nutmeg. 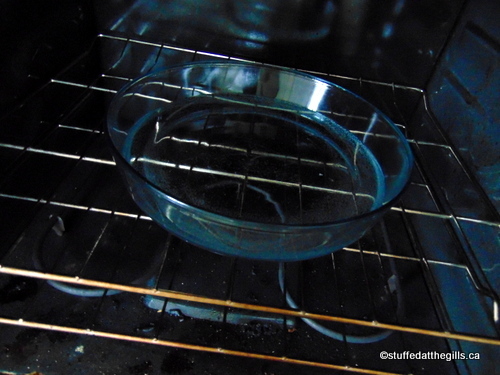 Place a large pan of hot water in the oven. This is a water bath or bain marie. This helps prevent burning and curdling of the pudding. Place the pudding in the water bath and bake 50-60 minutes or until there is no oozing liquid coming from the centre of the pudding. Serve the pudding warm or cold. Serve it plain or. . . . Serve it with cream or ice cream (my favourite way). 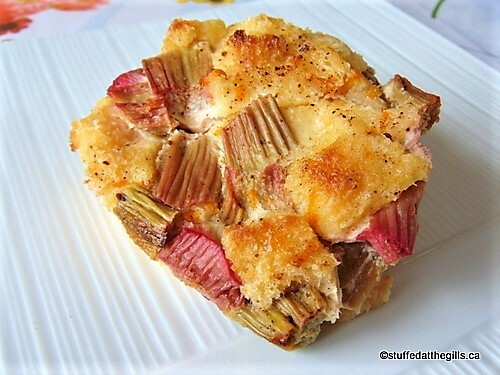 Rhubarb Bread Pudding is a great choice on a cold winter day. Hi Andrew. That sounds like the "Sinkers" I would buy as a child but I have no other details or recipe. I'd love to be able to recreate them. Thanks again Lois for the reply ...So from what I gather then, your memory aligns with my own in that, the "Sinkers" did have a raisin/apricot square type of pastry top and bottom with a spice /carrot cake type of filling for a center (which may or may not have had raisins!!??) ...You also mentioned that Chalkers' was across from your old school....I glean that it was the 7 Day Adventist school.... I have a salmon fishing buddy that also went to that school and perhaps I'll ask him if he also remembers these morsels... I'd like to be able to surprise him by taking out one of these "sinkers" on the river next time we go salmon fishing it would make for a nice riverside snack!!! What a wonderful title for your blog! 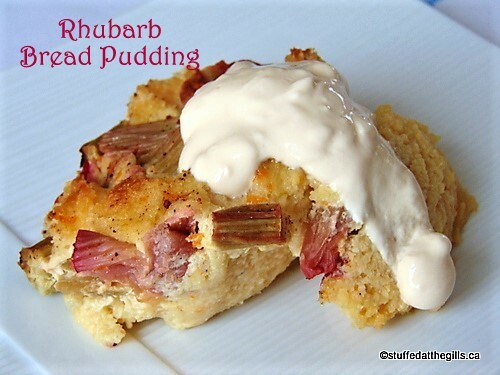 The rhubarb bread pudding looks delicious.